While 4K UHD TVs have four times more clarity than standard Full HD and is growing quickly in the global TV market, RGBW TVs are also appearing in the market and have a lower picture quality – in both pixel quantity and quality – than 4K UHD TVs . When the products are displayed alongside 4K UHD TVs in stores, consumers should be aware of what makes the 4K UHD TVs a better purchase option: the highest picture quality available. UHD TVs, also known as 4K, have approximately 8 million (3,840×2,160) pixels, four times the amount of pixels in Full HD TVs (approx. 2 million pixels, 1,920×1,080). This allows 4K TVs to display the same image with even more detail and clarity. However, what happens when the number of pixels is reduced? If the number of pixel increases from 2 million to 8 million within the same size TV, the size of the pixels have to be smaller in order to display even more vivid details. On the other hand, if the number of pixels decreases, the display projects lower resolution as a result. RGBW TVs utilize a pixel structure called RGBW (or WRGB), which differs from the RGB structure that 4K UHD TVs employ. This method converts some of the RGB sub-pixels to white (W) light, reducing the number of the pixels that can actually produce colors by 25 percent. This equates to a lower quality, less detailed picture on the screen. According to international standard organizations such as ITU, ICDM (formerly known as VESA) and ISO, one pixel – the smallest unit that produces colors on display – must be square-shaped with a width and height ratio of 1:1, to be capable of expressing the full range of colors. In the case of RGBW TVs, pixels are square shaped, binding three sub-pixels together to make up a pixel such as BWR and GBW. With this process, however, 75 percent of the total pixels are left with imperfect color structure. For example, BWR pixels cannot express the color green, meaning these TVs do not satisfy the international standard definition of a pixel. 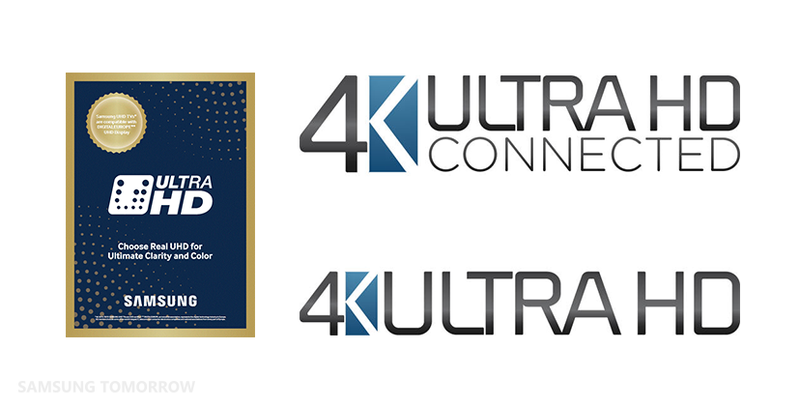 In order to provide consumers with accurate product information, CEA and DE- IT organizations in the US and Europe- have started a 4K UHD logo program. Only TVs that meet the strict UHD definition and requirements are allowed to use a 4K UHD logo from CEA and DE on all marketing materials including packaging. As a result, RGBW TVs cannot qualify for a logo, as they do not satisfy the definitions of 4K UHD. 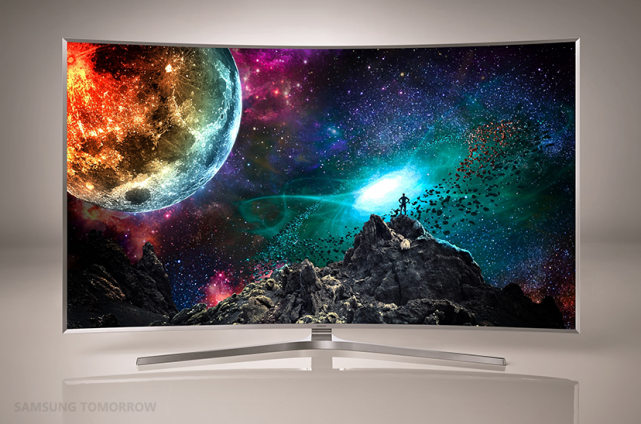 All of the Samsung’s 2015 UHD TVs qualify for CEA and DE’s 4K UHD logo program. Pixel – smallest element that is capable of generating the full intended functionality (e.g. color and grey scale) of the display. Note 1 to entry: In a multicolor display, it is the smallest addressable element capable of producing the full color range or the smallest element that is capable of generating the full functionality of the display. Pixel – Picture element: A pixel is the smallest element of the display surface which can reproduce the full range of luminance and colors of the FPD. Addressability – Addressability refers to the number of (complete) pixels that can be separately and adequately controlled. The reason why international standard organizations are so strict about the definition of a pixel is due to pixels having a large impact on a TV’s picture quality. For 4K UHD TVs, which employ RGB pixel structure, all pixels are aligned in order throughout the horizontal (3,840) and vertical (2,160) dimensions. However, RGBW TVs have lower picture quality since the white lights (in RGBW) cannot produce any colors, leaving the color of pixels unmatched between the lines. 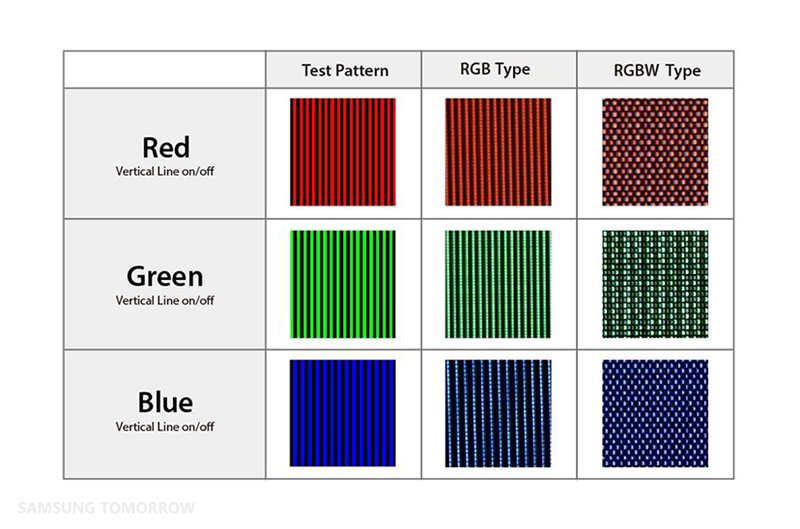 According to a study conducted by the Norwegian test agency Nemko, which investigated how thin stripes of red, green and blue colors are expressed on displays, RGBW TVs produced tile-patterned images while 4K TVs produced clean, sharp lines. To ensure a quality picture standard across the industry, these organizations established strict definitions of pixels. Samsung Electronics commissioned testing agencies such as VDE and Nemko for picture quality comparison tests based on international standards between 4K UHD TVs and RGBW TVs. The results from the testing agencies showed that the resolution of RGBW TVs falls short compared to that of 4K UHD TVs. Intertek and UL (Underwriters Laboratories) also published test reports on a Samsung TV product, using two TVs. One TV was equipped with an RGB panel and a second, the test model, was equipped with an RGBW panel. Despite such reports, RGBW TVs are still being displayed as having the same technology 4K TVs in retail stores. There are also reports by other testing agencies noting that RGBW panels meet international standards. This was determined by selectively choosing particular resolution tests using only the black-and-white pattern. This is problematic for consumers who are planning to purchase a new 4K UHD TV. Samsung Electronics has led the global TV market for nearly ten years based on the philosophy that the very basics of a TV is the ability to offer the best picture quality possible to viewers. This belief will be held as the highest value for Samsung TVs, even when future technologies evolve – from 4K, 8K and beyond.